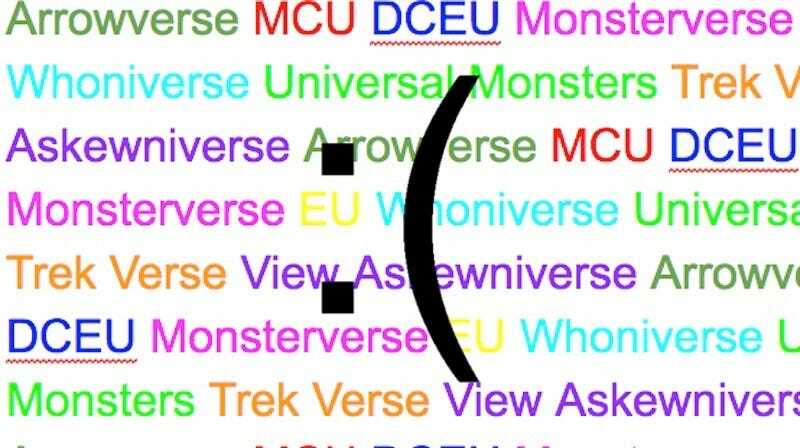 Why Does Every Shared Universe Have an Awful Name? It’s been confirmed that Legendary’s Godzilla-King Kong movie universe is called the “MonsterVerse.” It’s a name absolutely guaranteed to get confused with Universal’s new universe based on its old horror monsters. But it’s not that much better than Arrowverse. Or the DCEU. Or whatever Star Wars is using these days. Why is that the giant shared universes have such awful names? I think it’s because they have to be generic enough to cover a wide-ranging set of properties while still being specific enough to mean only one thing. Most of the time, they only really get one of these right, leaving them a mess to sort out later. The DC CW shows supposedly take place in the Arrowverse, which is a deeply confusing name since technically Supergirl takes place in an alternate universe and, since it’s the oldest, I’m betting Arrow goes off the air before the others. But you even something like DC/CW-verse or CW/DC-verse is inherently problematic because, thanks to a crossover, NBC’s Constantine technically shares this universe. So MonsterVerse and Arrowverse are examples of names that fall on the “too broad” and “too specific” poles, respectively. The Marvel Cinematic Universe, MCU, falls in the middle: it perfectly describes what you’re getting and cannot be confused with anything else... except, of course, it also includes the Netflix and ABC TV shows. Calling it the Marvel Universe would be the obvious choice, except the Marvel comics have been using it for decades already. Similarly, Warner Brothers and DC found themselves in a quandary with their comic book movies. DC Universe was taken by the comics, and it was a pretty perfect name. DCCU—DC Cinematic Universe—looks weird and would be copying Marvel, a big no-no. So they’ve gone with “DCEU,” which stands for “DC Extended Universe.” Which has three problems: 1) extended from what, Man of Steel? 2) everyone keeps forgetting the name exists and 3) when I do remember the name, I think it stands for “expanded universe” because that’s what EU used to mean for Star Wars. Why did Lucasfilm feel the need to change “Expanded Universe” into “Legends”? We already knew the Expanded Universe wasn’t part of the canon. Why change the name? Did “Expanded Universe” still sound too credible to them? Also, the canonical Star Wars universe doesn’t have an official name, so I guess all the new stuff is just “the Star Wars universe,” which works but is undeniably boring. The only name I have ever seen which both works and is almost clever is Whoniverse. It’s succinct, it sounds good out loud, and it pretty clearly only means one thing. Unless you’re the type of person who thinks about Doctor Seuss’s Horton Hears a Who more than Doctor Who. Dammit, none of these names work. Ever.